The original clothespin cookie recipe is listed on the back of the box that the cookie forms arrive in. Below is an easier version for those bakers pressed for time. This recipe yields at least 120 cookies depending on how you roll and cut the pastry. Preheat oven to 375 F degrees. On a lightly floured surface, roll 1/3 of one pastry sheet (2 sheets per box) into a 15 X 6 rectangle. Its very important to refrigerate the remaining pastry dough, it must stay chilled. You can roll this dough out smaller or larger depending on the size of cookie you prefer. Cut the strips with a pizza cutter, the wider you cut the strip, the larger the cookie; the smaller you cut the strip, the more cookies you get from the 1/3 pastry sheet. Wrap each strip around a cookie form, overlapping slightly and moistening edges as needed. Bake for 10-12 min. or until just slightly golden. Let cool slightly and slip off of cookie rod. We do not recommend putting cookie forms in dishwasher. All you need to do is soak in hot soapy water for a few minutes, then rinse and dry. For the filling; beat powdered sugar, shortening, butter, vanilla, and 3/4 cup of milk on high for 10 min. Add marshmallow cream, and food coloring if desired, and beat until combined. Pipe filling into cookies with pastry bag or a zip lock baggy with end snipped off. 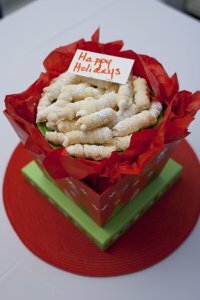 Dust cookies with powdered sugar and store in air tight container. These cookies freeze wonderfully. Enjoy and I hope this helps in your cookie baking adventures!